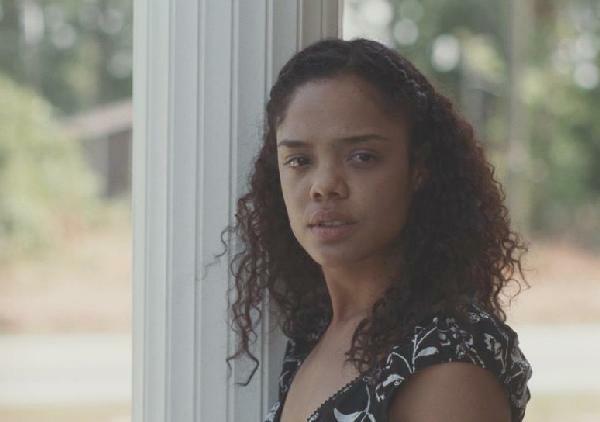 She’s currently starring in the independent film, “Mississippi Damned,” helmed by director Tina Mabry (Brooklyn’s Bridge to Jordan) and set to air March 3 and 15 on The Movie Channel. The movie, an autobiographical tale written by Mabry, is a powerful and honest look at how a young woman’s life is shaped while surviving the generational forces of poverty, family secrets, violence and sexual abuse. Thompson (pictured above) gives an impressive performance in an intense film about adult subject matters. Set in rural Tupelo, MS, the movie, which has screened at more than 20 film festivals nationwide, spans the years between 1986 and 1998. It stars Thompson, D.B. Woodside (24, Hellcats), Malcolm David Kelly (Lost, Saving Grace), Jossie Harris Thacker (Private Practice), Michael Hyatt (The West Wing, The Wire) and Tonea Stewart (In The Heat of the Night). I caught up with Thompson, who recently appeared in Tyler Perry’s For Colored Girls and has appeared in several television shows (Detroit 1-8-7, Off the Map), to talk about her latest role. Darlene Donloe: This movie haunted me. How did you come to be involved? Tessa Thompson: I got sent the script and went to meet Tina. It’s funny that you would use the word haunted. I felt haunted after reading the script. The writing felt really organic and real. When I read the words out loud, I knew I wanted to work on this movie. We traveled the film circuit for a while. It remains a special project to me and trumps other projects. DD: It was intriguing and emotionally draining. How do you prepare to shoot a film like this? TT: I’m not sure there is preparation for that sort of thing, other than having a clear idea of how the character feels about the world she lives in. There was a lot of jumping and hoping that the net would be there. Tina has a real gift with actors. She gives them space and she trusts them. That’s how she made me feel. All of the actors were so invested. It all came together. I’ve worked on projects where I didn’t have to go to dark places. I think I had a lot saved up. Mississippi Damned came around at the right time for me. I was ready to be challenged in that way. DD: You are doing a role based on Tina. Mabry’s life. She’s obviously someone you know. Does that make it easier or harder for you? TT: When I was cast, I didn’t know that. I had a sense because I knew that characters were composite characters in Tina’s life. She was incredible. She got out of my way. It didn’t scare me, it made me feel good. She never said much to me. She just orchestrated everything. DD: You did For Colored Girls, which was also a gut-wrenching role Now this gut-wrenching role. Is drama your preference? TT: I wouldn’t say it’s my preference. I have an appetite for stories that are heightened. After doing so much drama, I’m itching to do something lighter. DD: How has your life changed since For Colored Girls? TT: In some ways not at all and in other ways, tremendously. I got close to really incredible women I can call on. They are mentors. That’s the biggest thing. Apart from that, it gave me the opportunity to align myself with organizations I care about. You have the opportunity to work with some good organizations and raise money. It’s been really great to be asked to work with charitable organizations. DD: Key differences in story telling with big budget films vs. independent? TT: There are huge differences. It’s easier to get a movie made independently and not backed by a huge studio. You can tell stories in different ways. I love working on independent films. People tend to be invested more. You’re all in it together. Job descriptions aren’t as singular. You’re interested in all elements of an independent film. TT: I have a couple projects that are too soon to talk about. “Mississippi Damned” is available on DVD exclusively on the film’s website, www.mississippidamned.com. Next ArticleEUR Special Report: What's Wrong with Oprah's New Channel?